I love tea, but am just not a fan of flavored tea, with its clashing fruity or cloying, perfumy permutations. There are, however, big exceptions: chai, and tea with mint and cardamom. The latter is quite refreshing, whether it’s served hot or cold. Excellent as an accompaniment for lunch or dinner, especially with Mediterranean or Middle Eastern food. 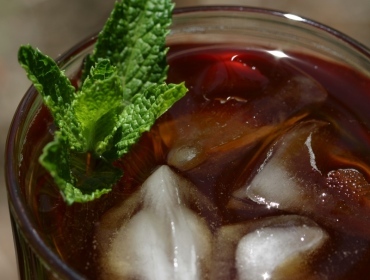 This iced tea will ease the weight off of a hot day. I usually use a strong, black Indian (e.g., Assam) or Sri Lankan (Ceylon) tea. Blends like English Breakfast or bagged black tea are fine, as long as they don’t contain additional flavorings. The iced tea requires three steepings (and ice to hasten the cooling process), and yields just over 2 quarts. The hot tea needs only two steepings (the first five steps of this recipe), and yields just under 1 quart. (These measurements are based on using a 1 pint teapot.) For both the hot and iced versions, make sure you have a carafe or jug which can tolerate boiling to ice-water temperatures. For the best spicy flavor, try to use unbleached cardamom pods, if you can find them. While not as aromatic, ground cardamom would work, although it’s more difficult to filter out than the pods and whole seeds. I use spearmint from the garden, but I wonder how using peppermint or other sweet-fragrant mints would turn out? 2 to 3 teaspoons green cardamom pods, lightly crushed (place ’em in a bag and apply rolling pin); or, 1 teaspoon ground cardamom. Stuff the mint leaves into a teapot. If using loose leaf tea, put it into a caddy; otherwise plop the tea bags into the pot. Put the crushed cardamom into the tea caddy or another one, if there isn’t enough room; if using ground cardamom, place it in the pot. Boil the water (electric kettles are marvelous! ), then pour it into the teapot. Steep for 5 to 6 minutes, depending on the tea strength. If making iced tea, place the half of the ice cubs into the serving carafe. When the initial steeping is done, pour the tea into the carafe. Filter out any loose mint or tea leaves. Pull out the mint from the teapot and discard. I’ve found that steeping mint much longer makes the tea rather bitter. I also noticed that the cardamom essence comes out more in the subsequent steepings, so it’s fine to leave the spice in the teapot. Boil more water again, and refill the teapot. Steep for 10 to 11 minutes for the third and final time. Place the other half of the ice cubes into the carafe. Pour in the tea, and stir a little bit. Refrigerate the carafe for at least 4 hours before serving. Pour into tall glasses or tumblers, add additional ice, sweeten to taste. This was written by sairuh. Posted on Saturday, May 5, 2007, at 2:29 pm. Filed under Food. Tagged drinks, Middle Eastern, recipe, tea. Bookmark the permalink. Follow comments here with the RSS feed. Post a comment or leave a trackback.